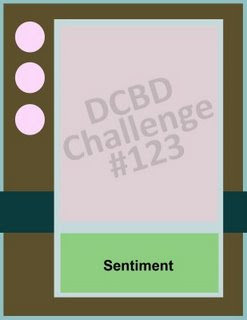 This is the card I made for the Clean and Simple Cards challenge in SCS.The challenge this time was to use bits of ribbons on the card. 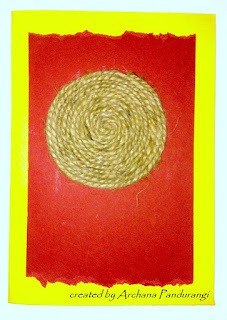 I pulled out thread from the corners of the ribbon to make it look a little different. I added punched flowers and light pink beads and the stamped the images.The stamps are from SU! Tags and more. This week's challenge was to create a scene. This is my first time. This is what I came up with.I took my inspiration from this card. 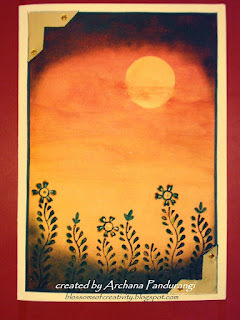 I made this card using watercolors. Love how they blend so well. 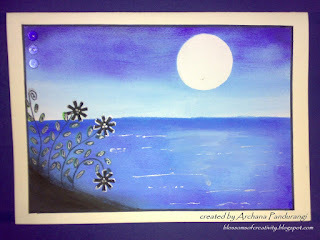 I also used violet ink.Just adore that color.The moon was created using the masking technique. I made this card for my brother's birthday. Its know as a Wiper card. 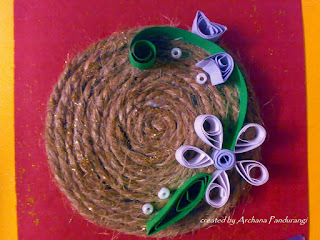 If you need the video tutorial please email me(archana88pandurangi@gmail.com). I will send the link to you. When you pull the card from both sides a Pop up appears. this is the top view. The pop-up can be seen inside. This is an OPEN SWING CARD. The yellow panel is a movable part.The green panel is adhered t0 the base cardstock and the yellow panel is pushed in without adhering. 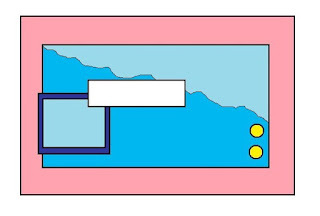 The area where all the 3 carstocks are together is punched and a brad is attached to it so that the yellow panel can be moved. This is how it looks when slided a little.. 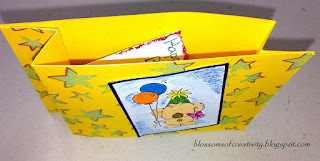 The message can be written on the base cardstock.Its a fun card .. You must try it out. 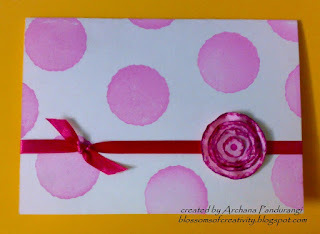 Here is my card for the Splitcoaststampers' CAS11Kids' Bedding Inspiration Challenge .I randomly stamped the circles in Orchid(color bar). 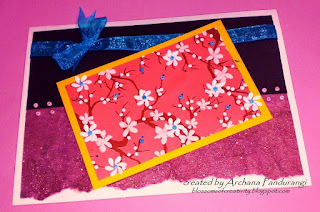 Added the ribbon and the paper flower. 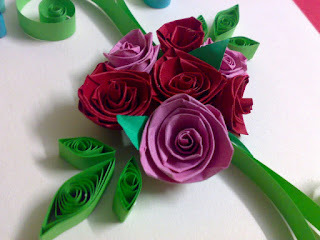 These flowers are really simple and can be made out of fabric as well as paper. STAMP: Little Shapes from SU! 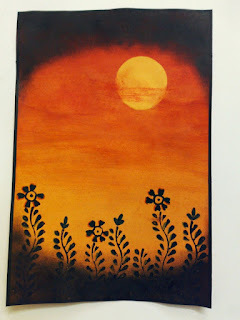 It was an Inspiration Challenge.This is the picture of my Inspiration. Here I made the main image on another paper and adhered it to the main cardstock.. Bordered it with mosaic overlapping the main image paper too... outlined the yellow mosaic with sky blue 3d outliner from Fevicryl. 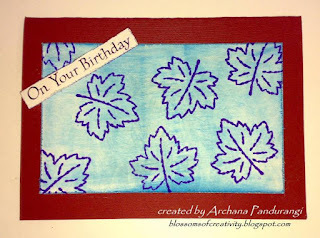 I drew the leaves on the white card stock and outlined them with white crayon.. used two inks(blue and red) and sponged the front part of the card stock..The parts which had crayon on them didnt catch ink. 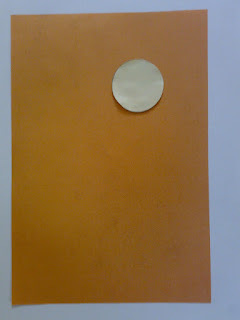 Then I cut out a leaf from a thick green hand made paper and stuck it to the pale yellow paper which was decorated with the tendril(used a 3D outliner from Fevicryl) and a simple tag and adhered to the main card stock . 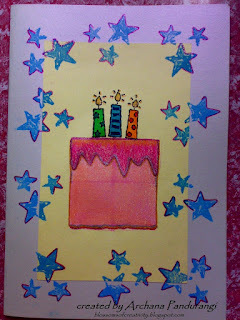 I highlighted the main image(cake) with oil pastels,glitter pens and colored the candles with markers... the stars as the borders are stamped 10 times... then highlighted with dark pink glitter pen.. I used the SU! Stars & swirls stamp here. Used the thumping technique. Added the sentiment, for the ribbon I cut a slot on the fold line and brought the ribbon through it outside.Assembled evrything together. 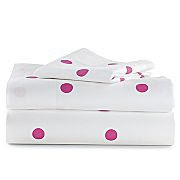 The sentiment is sponged at the corners. Just made a layout early this morning. 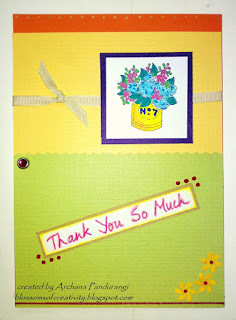 And made this card with the layout. The image is from SU! Tags & more. I useda COPPER 3D outliner on the bow. Did lots of layering for the first time. 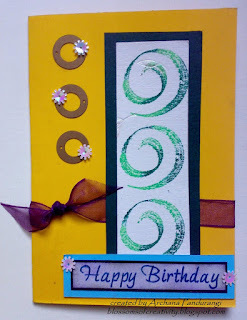 Also stamped the DP with SU stars and swirls. 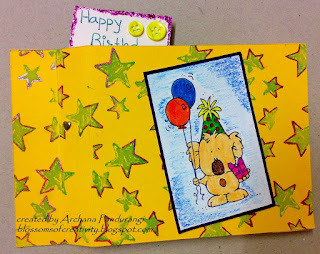 I cut the Design Paper in this shaped and adhered the rectangle on the main maroon card stock. Then I folded the triangle and adhered it onto the rectangle as seen above. 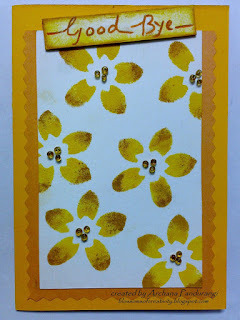 Here is the card I made for the CAS10 challenge on Splitcoaststampers.Here Ive used two shades of yellow.. CHROME YELLOW and YELLOW OCHRE This flower is a part of a stencil I have. 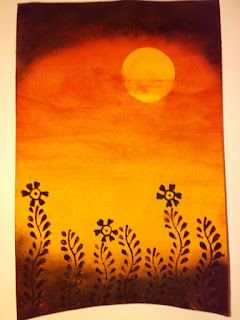 I used water colors and SPONGED it. (tubes-they are thick paste and dont bleed when used on stencils)Then i added those beads and the sentiment is hand written. This is a close up. These beads add good dimension wherever used. 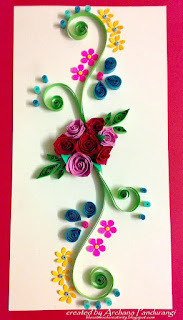 This one's a combination of quilling and punch craft.To my suprise I started this in the afternoon and finished it by evening.. never thought I would. 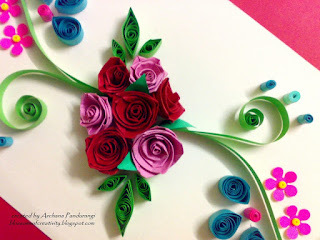 quilled roses are my favourite but this time I wanted to try something new. Im happy!!!! Im adding a few more pictures of this one, a few close-ups. Tight rolls are so much fun to make. I loved making them. Do let me know what you think about it. I would love to hear from you. 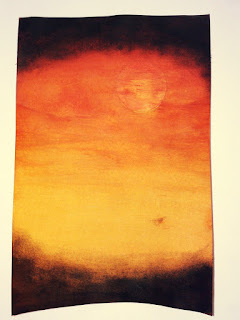 Here is the sunset scenery card that I was wanting to make from a long time and I finally DID it. 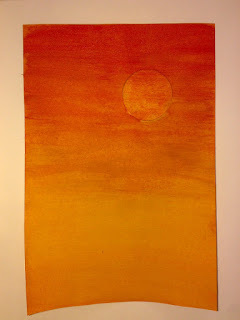 I took a yellow ochre card stock and used a cut Post It Note as a mask for the sun. 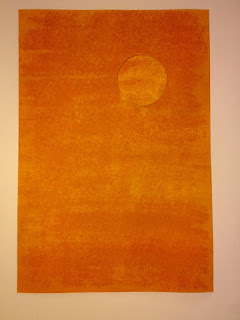 Sponged yellow chrome water colour on the entire card stock(cs). Mixed a darker orange and red color and sponged it on the upper half of the cs. Blended the centre with the sponge used for yellow chrome.Blending gives a more natural look. Sponged black ink both on top and bottom of the cs. Used a black marker to border the cardstock. 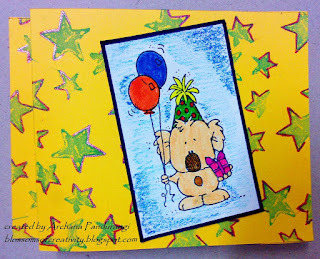 It acts like a faux layer.Highlighted the stamped image with orange and green markers. Assembled everything together. Completed the card. 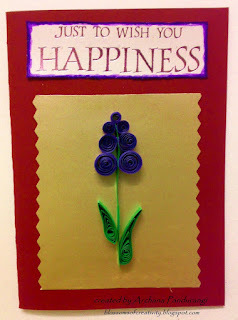 I quilled this one with my new quilling tool. 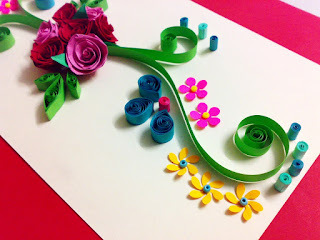 Having a quilling tool makes quilling so very simple. 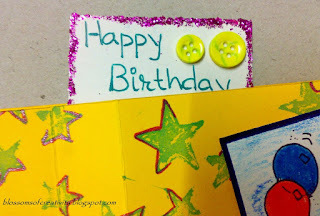 I glued the quilled pieces to the golden card stock. Assembled everything on the main Maroon cardstock. I recently tried distressing for the CAS challenge card (here for the sentiment) and I must say the look it gives is great. 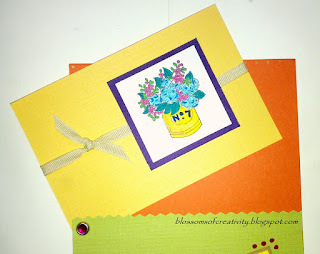 Here is the card I made for the Clean and Simple Cards (CAS) Challenge. 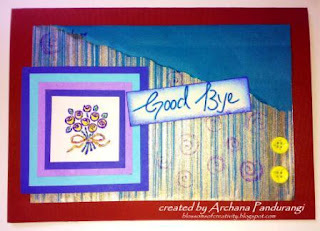 I distressed the edges of the main stamped cardstock and the sentiment. 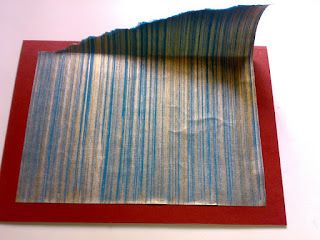 The blue ink is applied direct to paper. Assembeled the card. I received the mail of my first blog candy... This is so much fun! 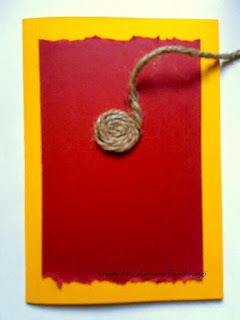 This is what i won.... 12 spirals, 12 leaves and a Quilling tool. She has amazing tutorials on her blog. Her quilled creations are great. Thanks a lot! This is going to make Quilling so easy. 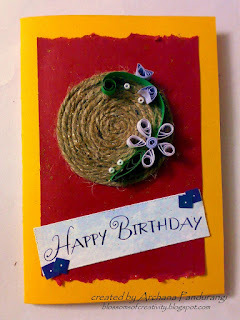 Here is a card I made by using JUTE STRING. 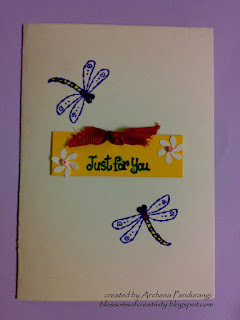 You can use it as a base for any of your embellished or quilled cards. Here's how to do it. 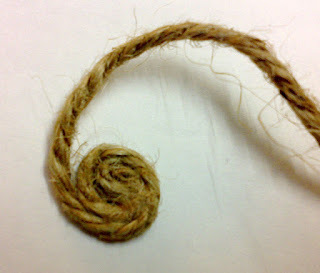 Start with curling the string holding it in your hand. Use a strong glue to stick it. Once you have an adequate size stick it to the main card. This makes the coiling process easier. This is how it'll look after completion. Ofcourse the size of the circle depends on your preference. 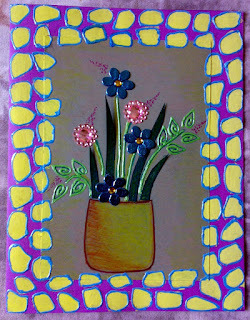 Here is the close up after is added the quilled flowers and leaves. 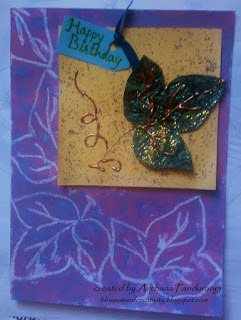 I used a brown cs and a handmade paper (glittery one) for the layers behind. 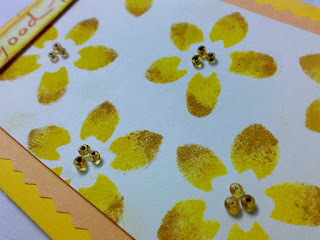 For the front layer I glued a patterned paper to the yellow cardstock and added White Punched flowers. 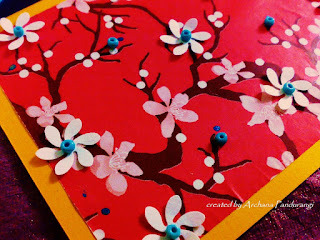 Stuck blue beads to the centre of the flower and a few other places on the patterned paper. Here is the close-up of the front layer.